On this list, you’ll find a trio of Capitals, including a triple Ted Lindsay Award recipient, along with a pair of top-shelf Golden Knights. 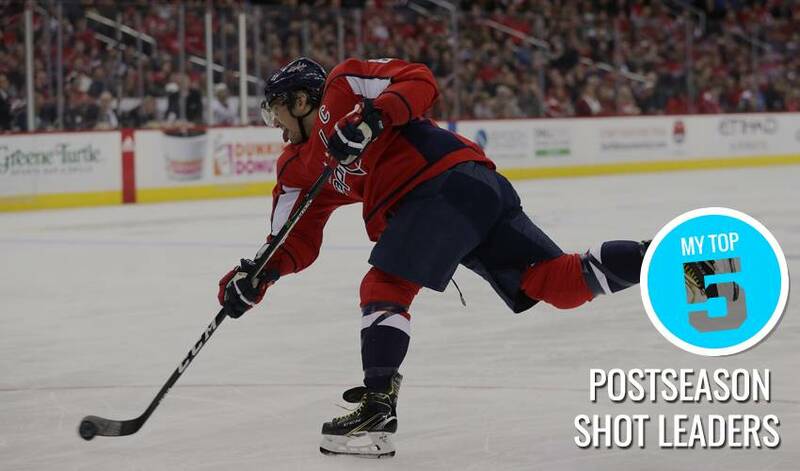 The Capitals captain has been a force for Washington throughout the post-season. Showcasing a 17.5 shooting percentage mark and averaging 4.1 shots per game, the three-time Ted Lindsay Award reciepient (2007-10) is taking aim at a trip to the Stanley Cup Finals. Averaging 4.2 shots per game, the Golden Knights forward had a pair of goals (on eight shots) as Vegas beat Winnipeg 3-1 in Game 2 of the Western Conference Final. In 12 Playoff games, Marchessault has six tallies and 15 points. Averaging 3.5 shots per game, the crafty forward boasts a 16.3 shooting percentage mark, along with eight goals and 19 points for Washington. He has 10 points in his past five playoff games, including five points in the opening two games of the Eastern Conference Final. The versatile blueliner has made his presence known at both ends of the rink in the Playoffs. Carlson has three goals and 14 points in 14 post-season games, to go along with a plus-6 rating. He’s also averaging 26:16 of ice time. The 30-year-old Ontario native is averaging 3.8 shots per game in the Stanley Cup Playoffs. In 92 career post-season games, Neal has 28 goals, including five game-winning markers. The left wing has seven points in 12 Playoff games in 2017-18. Averaging 3.3 shots per game, the Finnish standout has 11 points (4 goals, 7 assists) so far in the post-season. The Winnipeg right wing, who fashions a plus-5 rating, has two goals and three assists on the power-play and is averaging 17:27 of ice time. Kucherov has six goals and 14 points in 12 Playoff games in 2017-18. Tampa Bay’s offensive superstar, who is averaging 3.8 shots per game in the post-season, finished third in regular season scoring with 100 points (39 goals, 61 assists). The Washington Capitals have won the 2018 Stanley Cup, defeating the Vegas Golden Knights in the Stanley Cup Final with a 4-3 victory in Game 5 at T-Mobile Arena in Las Vegas on Thursday night. How would Mark Hunter describe Washington’s John Carlson’s one and only season with the London Knights? Untapped. Dennis Maruk won’t be painting his face to feature the Washington Capitals logo, but the franchise’s first 60-goal scorer will be wearing his heart on his sleeve for the Stanley Cup Final.